When I first received my invitation to serve in the Peace Corp, I really wasn't sure the exact location of Kazakhstan. I thought it was near Mongolia, but I had to find a map to be sure. I wasn't expecting a country 4X the size of Texas (actually it is the 9th biggest country in the World). All of that space and only 14MM people. The photo to the right is a picture from Almaty, the Southern Capital (old capital). I spent my first 10 week in a small city called Issyk that is about 45 minutes away from Almaty. 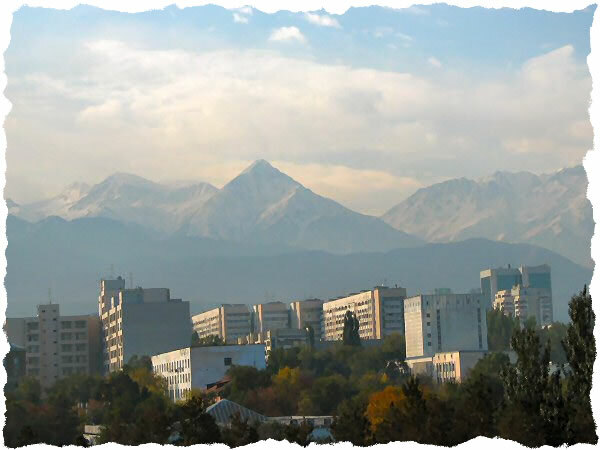 The Peace Corps Kazakhstan Headquarters is also located in Almaty. On December 16, 1991 Kazakhstan gained independence with the break up of the Soviet Union. Since that time, Nazarbayev Nursultan Abishevich has been the president of Kazakhstan. After independence the Kazakhstan government has tried to promote some of the religious, cultural and linguistic traditions that were not considered important during the Soviet Reign. For example, the government set aside 1% of the Federal budget to promote the Kazakh language. The current constitution requires that the President be fluent in Kazakh and the spring holiday Nauris has been reinstated as a national holiday. Additionally on December 10, 1997, Astana was established as the capital of Kazakhstan. Kazakhstan is divided into 14 oblasts (regions). The largest city in Kazakhstan is Almaty (around 1 million people) but there are several other populated cities including: Shymkent, Taraz, Aktau, Aktobe, Astana, Ust Kamenogorsk, Karaganda, Kizlorda and Atrau. Since I am living and working in Uralsk during my two year Peace Corps experience, I will primarily focus on Uralsk and the West Kazakhstan Oblast on this site. I am sure there are many other volunteers that would like to share their views on cities and villages across Kazakhstan. Native Kazakhs, a mix of Turkic and Mongol nomadic tribes who migrated into the region in the 13th century, were rarely united as a single nation. The area was conquered by Russia in the 18th century and Kazakhstan became a Soviet Republic in 1936. Soviet rule in Central Asia was a parade of ridiculous ideas: assimilating the region's ethnic groups, converting the steppe into a giant cotton plantation, using Kazakstan as a 'secret' nuclear testing zone, etc. By the late 20th century, serious environmental problems developed throughout Kazakshtan. Along with the other central Asian republics, Kazakhstan obtained its independence from the collapsing Soviet Union in 1991. Kazakhstan proclaimed its membership in the Commonwealth of Independent States on Dec. 21, 1991, along with ten other former Soviet republics (forming the CIS). The Peace Corps arrived in Kazakhstan in 1993 (to date over 600 volunteers have served in KZ). At any given time, there are between 120 to 160 volunteers serving. My class (KZ14) will have 25 volunteers and all 25 are focused on economic development within Non Government Organizations.